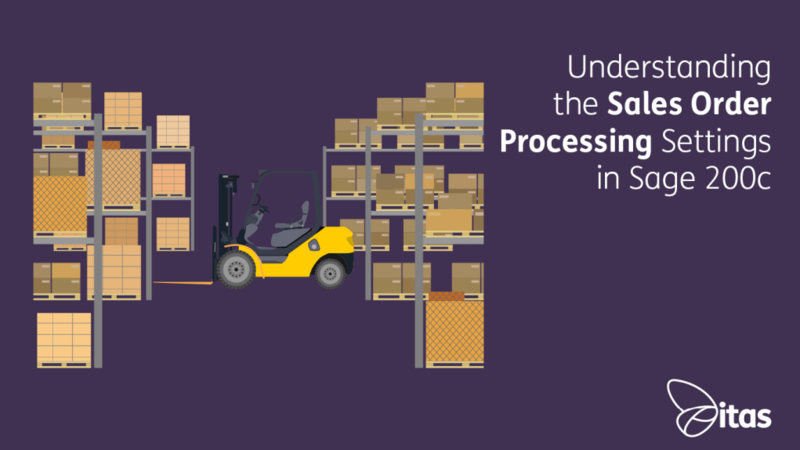 The Sales Order Processing module also known as SOP, is part of the Sage 200 Manufacturing package. SOP is different from the Sales Ledger, as it allows the user to process orders with the use of stock. There are many settings within the SOP module which if not configured correctly, can restrict it’s functionality. The settings page can be found in the SOP > SOP Utilities > System Setup > SOP Settings. The settings window consists of 6 tabs. To ensure each settings tab is covered in depth, the blog will be separated into multiple editions. The first will explore Document Numbering, and Order Entry. The first tab in this window is focused on the numerical codes of the orders and returns. 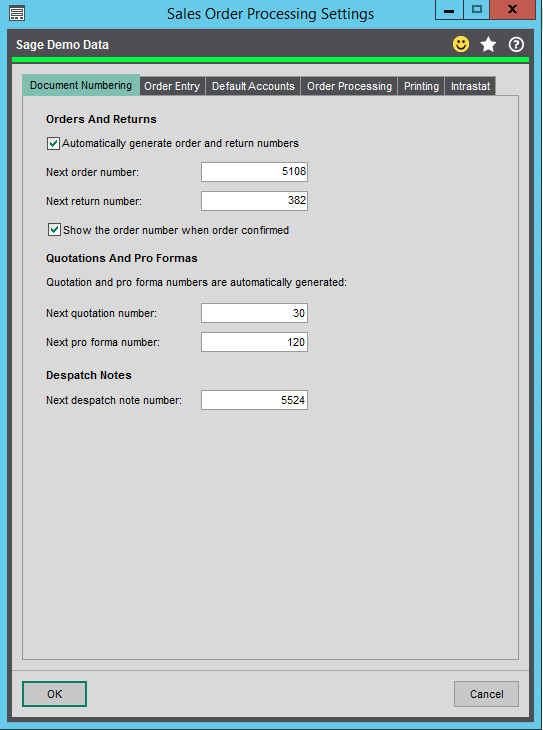 When the Automatically generate order and return numbers is ticked, it means that once an order/return is complete, the system will create a number for that process. In the box below, you can specify what you would like the next order/return number to be, and it will continue from that number. Without this box ticked, you will have to manually enter a numerical code after each process. The option below this, when ticked, will pop the order/return number up on the screen once it is confirmed. This is beneficial if you wish to take note of the number. Otherwise, you can un-tick this box, and you will not be notified. specify what number you would like next for both these processes. However, you are unable to choose to create this manually. The Quotation numbers and the Pro-Forma numbers are automatically generated by default. The final setting within this window is for the despatch notes. Again, you can alter what the next despatch number will be. However, the system will automatically create the number, instead of you manually entering this once confirmed. The top set of options within the order entry tab is regarding the types of items you are allowed to create an entry for. This means that when you create a sales order and you add items, you can control what types of items can be added. Selecting the top option will allow both standard and free text items. The second option will only allow standard items, and the final option will only let you enter free text items. The configuration of these settings, will affect the options you have available when you enter the Create New Order Item Line screen. To allow the amendment of the analysis codes and the nominal codes, both these tick-boxes must be ticked. Analysis codes are a way to search and filter your data in greater depth. The nominal codes are how the stock items are categorised within Sage. Making changes to the analysis codes in the order header entry can also be set to ‘allow’ in this window. If un-ticked, the analysis codes section in the Delivery & Invoicing tab will be greyed out. This can be found when in the Enter New Order – Full window, as shown below. If you do not wish to give people access to these amendments, simply un-tick. The final block of settings within the order entry tab will affect how you process orders along with payments. There are three options; Allow payments to be recorded during full order entry; Invoice payment with order immediately; Enable card processing. The first option when ticked will let you include a payment when entering a sales order. This setting is only valid when entering in the full order entry window. You can also enable the system to invoice the payment immediately after the order has been confirmed. To do this, tick the second tick-box. In addition, if you wish to record the user’s name who created the document, you can select that here. The tick-box at the bottom of this settings window allows to to note them down as the document taker, if you wish to keep track of who is creating what. As mentioned earlier, there is a lot to discuss regarding SOP settings. It is best to break down all the tabs and tick boxes into manageable chunks. So far, we have covered how to alter document numbering and choose what number you would like next. This is relevant for your orders and returns, your pro-formas and quotations, and your despatch notes. 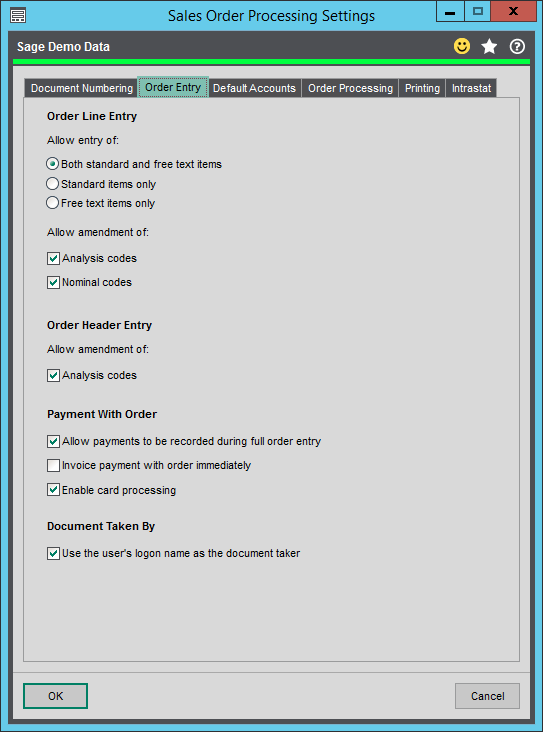 We have also explored what you are able to enter into Sage whilst in the Sales Order Processing module. We can restrict what type of stock item can be added to an order, and whether or not you can allow payment to be taken whilst creating the Sales order. The next blog of this series will explain to further tabs within the SOP settings; Default Accounts and Order Processing.